Summer is heating up, and that means that I want to spend as little time in the kitchen as possible. Who wants to be standing over a hot stove for hours? That's why I love simple, no-frill recipes that are delicious and that utilize the products and flavors we love most. Hidden Valley Ranch has become a staple in our Summer pantry for making amazing dips and topping our fresh salads, but it is also great used in a main dish too. 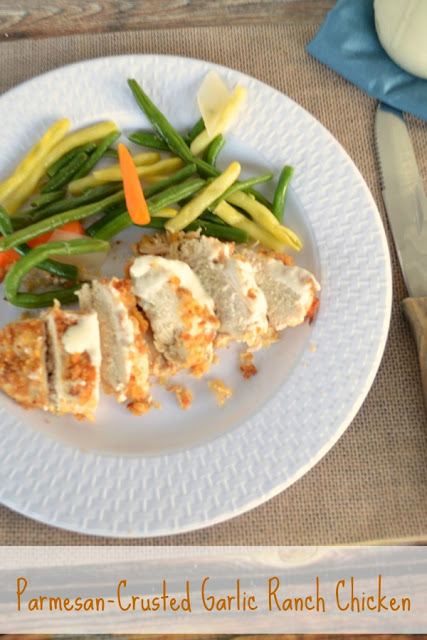 This Parmesan-Crusted Garlic Ranch Chicken is the perfect quick and easy Summer meal created with the all new Hidden Valley Ranch Roasted Garlic flavor. 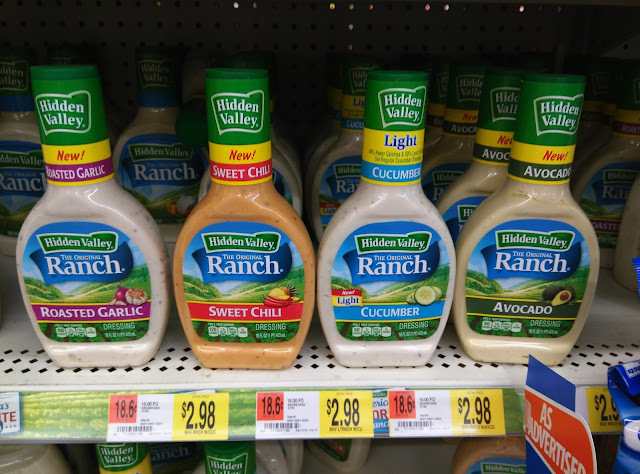 Hidden Valley Ranch is the same brand you've known and loved your whole life, but now they are spicing things up with a line up of all new flavors. Available at your local Walmart store, Hidden Valley Ranch is now available in great new flavors including Avocado Ranch, Cucumber Ranch, Cucumber Ranch (Light), Sweet Chili and Roasted Garlic. 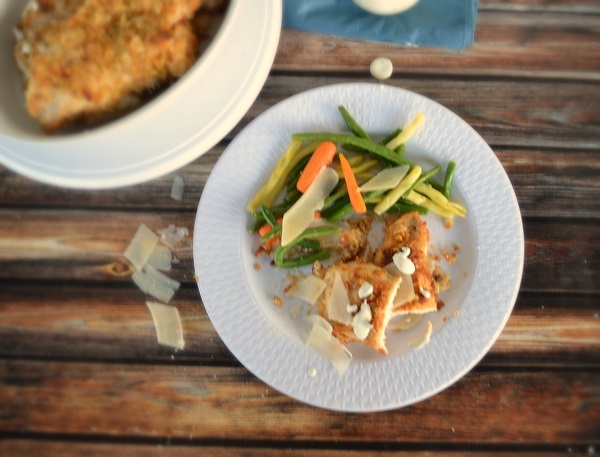 I love experimenting with ingredients, and these new flavors are perfect for trying out different flavors in our favorite Summer-time recipes. Check out the Parmesan-crusted garlic ranch chicken recipe that we created with the new Garlic Ranch Hidden Valley Ranch product below, and the head on over to the Walmart site to claim your coupon for $1 off any one bottle to try one of the new flavors for yourself. In a food processor add 1 sleeve of Ritz Crackers and Parmesan cheese. If you do not have a food processor crumble the crackers until they are finely chopped. Pour the Hidden Valley® Original Ranch® Dressing into a large bowl. In a shallow bowl, add the Ritz Crackers and Parmesan mix. Dredge each breast in the bread crumb and cheese mixture. Bake the chicken for 20 to 25 minutes until the chicken is crisp and an internal temperature of 165°F is reached. 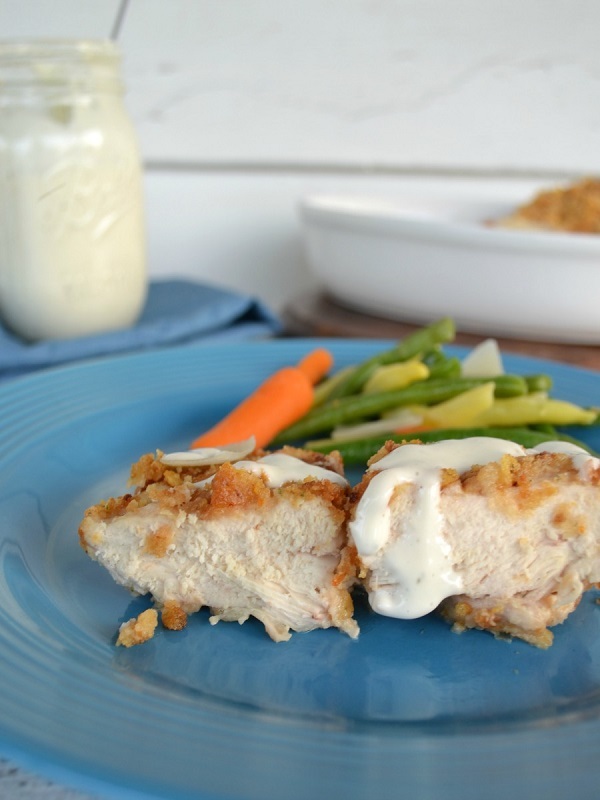 Want to try this recipe out for yourself? Remember to stop by and print your coupon for $1 off of Hidden Valley Ranch Dressing.